Charlie wanted it to be complementary to Bitcoin and believed Litecoin offered some key advantages. He also wanted Litecoin to be a fair distribution and thus there was no pre-mine of the currency like we have seen from several other competing cryptocurrencies. Charlie is still leading its development and very active in the cryptocurrency community. Charlie also worked for coinbase.com for a long time, before quitting in June of this year to focus on Litecoin full time. Yet, there are only 4 times more Litecoin in existence than Bitcoin. Given how long Litecoin has been along, the trust it has established and some clear technological advantages over Bitcoin, one would expect the gap in their valuations to be smaller. Note that both Bitcoin and Litecoin are deflationary. With Bitcoin, 16.7 million of the maximum supply of 21 million have already been mined. With Litecoin, 54 million of the maximum supply of 84 million have been mined. They are both vastly superior to inflationary fiat paper currencies that governments and central banks use to concentratre their wealth and power. Certainly, part of the answer is that Bitcoin has better name recognition and was the first-mover in the cryptocurrency space. It has the best liquidity and is the most paired trades with other altcoins. Bitcoin is improving their network tech with Segwit and will likely implement the Lightning Network, atomic swaps and privacy features at some point in the months ahead. If we assume that Bitcoin’s advantages in name recognition and Litecoin’s advantages in technology/usability are a wash and simply focus on relative supply, we should see the Litecoin price at roughly one quarter (1/4) the Bitcoin price. With Bitcoin currently at $7,200, this gives us a Litecoin price target of around $1,800 ($7,200/4). This is 30x the current price of $60! Yet the Bitcoin-to-Litecoin ratio is currently at 116. This is nearly double the 20-year avearge gold-to-silver ratio. The chart below shows the Bitcoin-to-Litecoin ratio over the past several months. Notice this ratio has more than doubled since July, as the Bitcoin price has rocketed higher and outperformed Litecoin. However, year-to-date in 2017 Litecoin has been the better performer by a 2-to-1 ratio. While Bitcoin has generated an amazing year-t0-date return of 665%, Litecoin has blasted 1,332% higher! The Bitcoin-to-Litecoin ratio was over 200 at the start of the year. Although it has come down towards 100, I still believe it will drop much lower before these two currencies have a more sensible price relationship. The recent outperformance of Bitcoin vs. Litecoin has largely been driven by multiple hard forks on the Bitcoin network. When the hard forks occur, those holding Bitcoin receive an equal number of the new forked coin such as Bitcoin Cash, Bitcoin Gold or the upcoming fork into Bitcoin Segwit2x (B2X). This has caused investors to sell Litecoin and other altcoins in order to buy more Bitcoin and get more free forked coins. But once this Segwit2x fork has passed, I expect Bitcoin to sell off and altcoin prices to rise significantly. 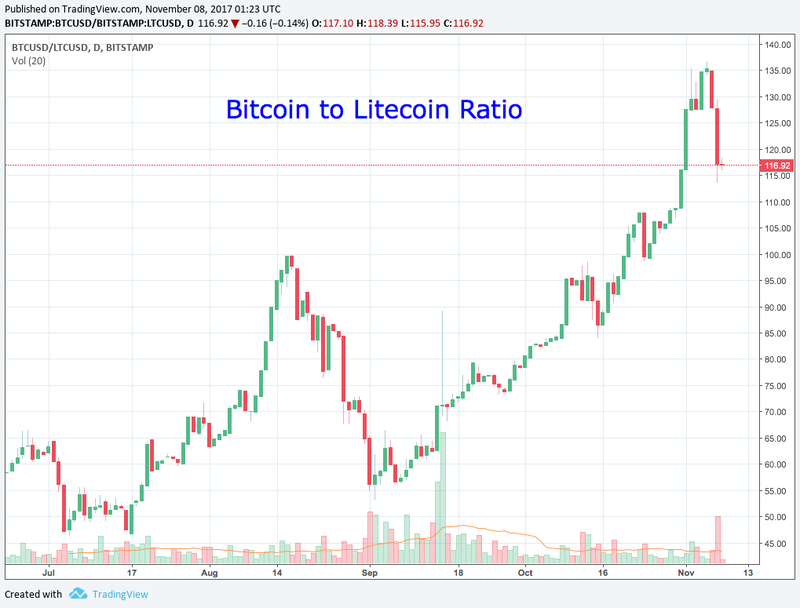 The drop in the Bitcoin-to-Litecoin ratio over the past few days from 135 to 116 has been driven by positive news for Litecoin. 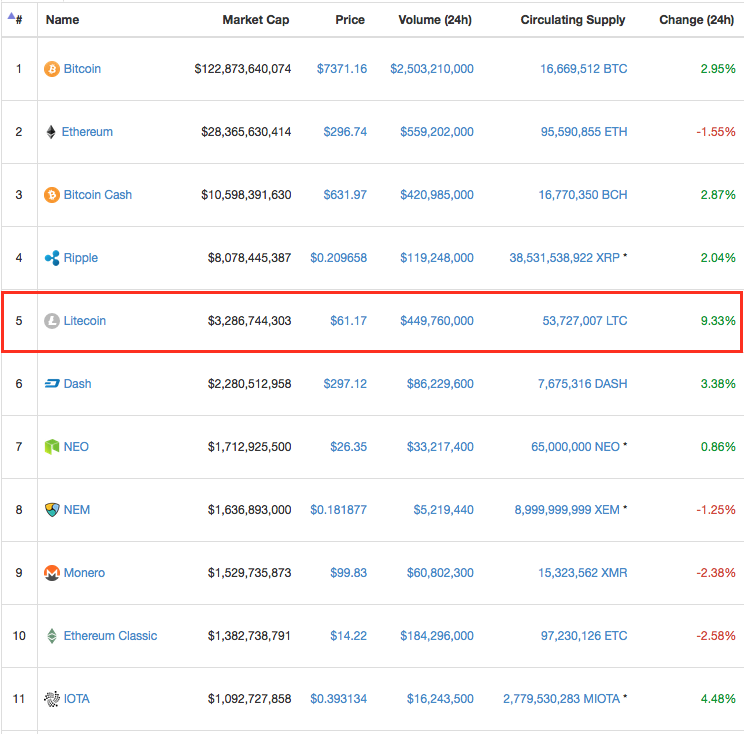 Major South Korean exchange Coinone has added Litecoin to its platform as of early November 2017. The exchange has reportedly processed $3.2 mln worth of Litecoin in the first 24 hours of trading. This has caused the Litecoin price to rally 15%, while the Bitcoin price has corrected from the all-time high of $7,600 to $7,100. Yet, Litecoin at $62 is still trading significantly below it’s September high around $90. It has been seriously lagging behind Bitcoin, but I expect the Litecoin price to catch up in the weeks ahead. While most investors appear to be holding their Bitcoin or adding to their positions ahead of the November 16th B2X fork, there are signs that funds are starting to flow from Bitcoin into deeply oversold altcoins. Some of our favorite altcoins have bounced sharply off multi-month lows in the past few days. A number of cryptocurrency investors are clearly looking to get a jump on the herd which is likely to wait until after November 16th to move back into altcoins. This may be a good strategy to consider. The market is currently pricing Segwit2x at $1,300 via futures trading. This is a premium of 18% to the current Bitcoin price. Yet, many altcoins would need to double or triple to return to previous highs. And if the Bitcoin price crashes following the fork as expected, investors that don’t sell out immediately are going ot take a loss during the correction. If the Bitcoin price falls towards $5,400, this would essentially wipe out any gains from getting free B2X tokens. Given the above analysis, we have started to buy oversold altcoins in anticipation of a major rally ahead. The returns expected from the altcoin bounce are significantly larger than the current value of Bitcoin Segwit2x tokens. We will still benefit from the fork, as it has caused our Bitcoin holdings to shoot 65% higher over the past month. We can now use those BTC to buy significantly more altcoins than we could have just a few weeks ago. 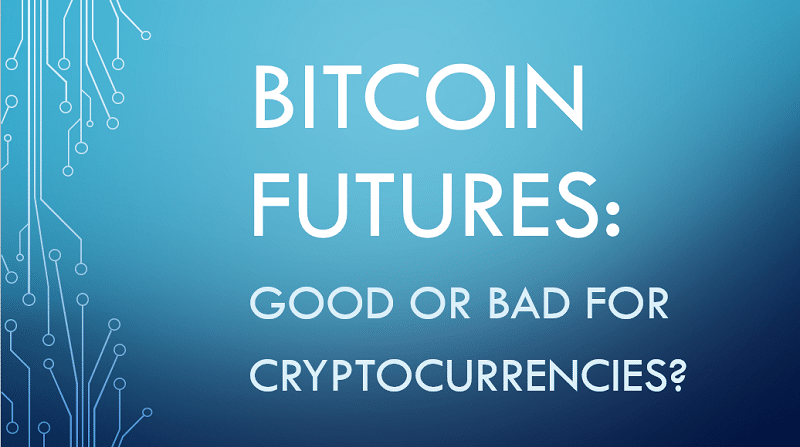 This creates an incredible opportunity for value investors as the buying opportunity is enhanced by both the recent Bitcoin rise and altcoin correction. You will get our model portfolio of cryptocurrencies and top stock picks, our monthly contrarian newsletter, weekly trade alerts, ICO tracker, Beginners’s Guide to Investing in Cryptocurrency and much more. It is a tremendous value for the money and most of our subscribers say that the subscription pays for itself many times over. Our investment research is best viewed as an investment itself. If you aren’t seeing a positive ROI from the information that we provide, simply cancel your membership and walk away. Click below to get started now!